New All-Star jersey photo leaked – Should we love it or hate it? A leaked photo suggests the 2015 All-Star Game jerseys have a chrome-heavy look. But is the image of a practice jersey or a game jersey? That affects how we feel about it. posted on the website Icethetics, the chrome takeover continues. The key detail missing: we don’t yet know what this jersey will be used for. If it’s a practice jersey – and it sure looks like one – it’s pretty darned cool. 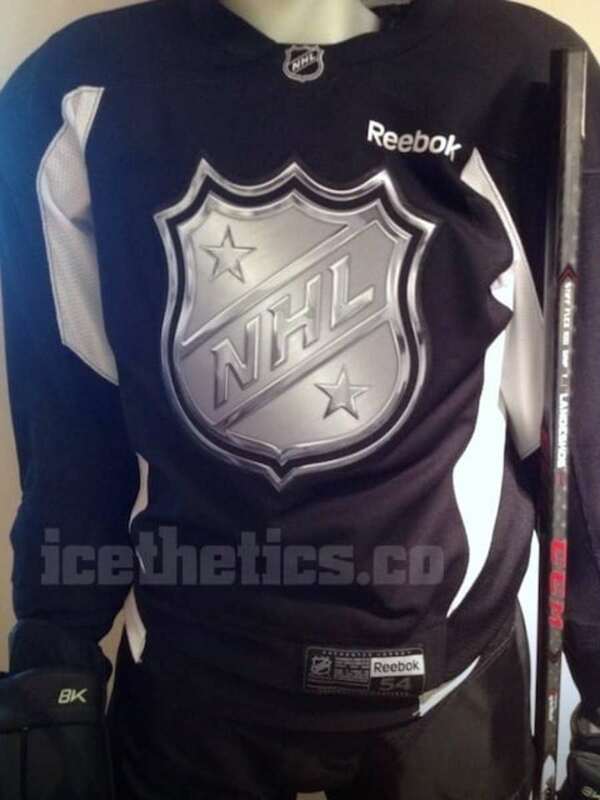 The black and white are simple and classy enough, and the huge, shimmering NHL crest immediately grabs the eye. an earlier blog pointing out that the merchandise for the Columbus-hosted All-Star Game has a heavily black-and-neon-green color scheme. The good news is it’s more interesting than black, silver and white. The bad news: it looks stolen from a roller hockey league. Then again, there’s no such thing as too tacky when it comes to the All-Star Game.